Oh, right, the infamous Schiavo case. I should’ve remembered – especially since I wrote so much about it back in the day. I should’ve remembered Florida governor Bush’s flagrant abuse of executive power, his relentless, unconstitutional attempts to impose his moral standards on a long-suffering spouse. Coincidentally, we’re approaching the 10-year anniversary of case closure. And with Jeb tuning up fast for a White House bid – a bid arguably strengthened by Mitt Romney’s self-deportation – this is indeed an opportune time to revisit his conduct. Because it does raise questions about his character. To refresh your memory: A 26-year-old Florida woman, Terri Schiavo, collapsed in 1990. From lack of oxygen, she suffered irreversible brain damage. Permanently comatose, she hovered near death, kept alive by a feeding tube. After eight years of stasis, her husband Michael decided it was time to remove the feeding tube and let nature take its course. Her parents objected, so a trial was conducted in a Florida court. The judge, after hearing doctors’ testimony, ruled that Terri was in a “persistent vegetative state,” and that her brain had been “replaced by spinal fluid.” On Feb. 11, 2000, this judge (a southern Baptist Republican) gave Michael permission to remove the feeding tube. This was before he tried to do stuff that he wasn’t empowered to do. The feeding tube was not removed; Michael’s in-laws managed to tie up the case well into 2003, arguing in various appeals that the doctors’ testimony had been wrong. They wanted the case moved to federal court. Jeb jumped in for the first time, filing a legal brief to move the case to federal court. 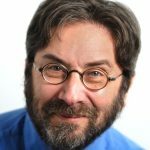 That effort was rebuffed; the ruing judge said the case had to stay where it was, in state court. And again, Michael was told that he could remove the feeding tube. He did. This was on October 15, 2003; the prognosis was that Terri would die her natural death by the end of the month. But Jeb had decided for himself that removing the tube was morally wrong – no matter what the courts had said, no matter what the doctors had said, no matter what Terri’s spouse wanted. He quickly cooked up a bill (“Authority for the Governor to Issue a One-time Stay”) and whisked it through the compliant Republican legislature in less than a day. He then issued an executive order compelling doctors to reinsert the feeding tube. A state judge soon ruled that Jeb’s move was unconstitutional. Not long after, the state Supreme Court unanimously ruled that Jeb’s move was unconstitutional. (The state Supremes said that Jeb had tried to subordinate the judicial branch, and had violated “the rights of individuals, including the well-established privacy right to self-determination.”) Undeterred, Jeb asked the U.S. Supreme Court to back him up. The U.S. Supremes refused to get involved. But a federal judge said that Congress had no business getting involved, that the case belong where it had always been, in the Florida courts. So the tube stayed out, and Terri was finally allowed to die, on March 31, 2005. 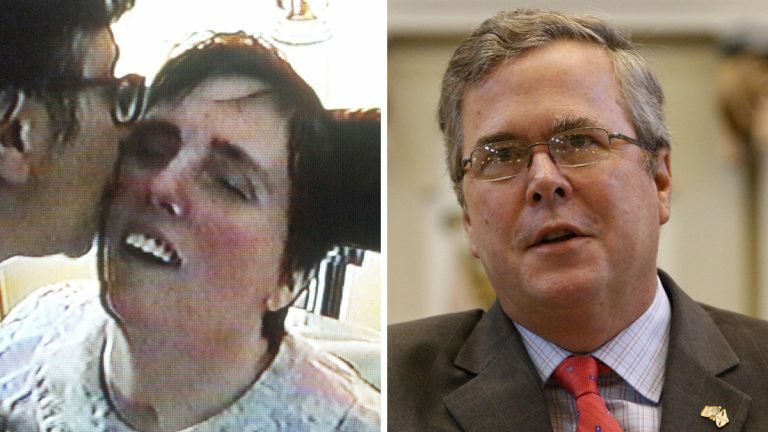 So in June ’05, even after Michael had finally gotten closure, even after the autopsy report had supported the doctors’ original testimony – Terri’s brain had atrophied, she had “no remaining discernible neurons,” she couldn’t even feel pain – Jeb kept going. He tried to target Michael for prosecution, claiming that Michael may have played a role in Terri’s collapse…back in 1990. The case ended there. And I doubt it will come up during the ’16 GOP primary season. Jeb’s conservative rivals want to paint him as a moderate (especially on immigration and the Common Core education standards), and it would wreck their narrative to highlight his right-wing morality crusade. Nor will Jeb bring it up, because to win the White House he needs moderate swing voters. Nor will Republicans highlight Jeb’s power abuses in the Schiavo case, because “executive overreach” is a charge they prefer to aim only at Obama.